Though I am loathe to admit it, my Paris eyes are not as fresh as they used to be. When I first arrived in Paris, it seemed that everything I saw begged to be appreciated, mocked, blogged about, or all three. ... you know it's time to wake up. On our leisurely walk around Paris, we stopped for a good five minutes to analyze the flowing mane, the furrowed brow, and that far-off look that makes you wonder whether he is going to seduce you or club you to death with a blunt rock. Part-man, part-wildebeest... we had to know more. Once we were on the lookout, it seemed he appeared everywhere. On the corner near the Bon Marché, outside of the Institut du Monde Arabe, in countless locations throughout the Marais. At one point, we were gazing at his countenance only to see him pop up on another rotating billboard just meters away--this time in a car advertisement. It was like a dare to see who could be manlier: him... or him. Surrounded by his image, we vowed to get to the bottom of this mystery. 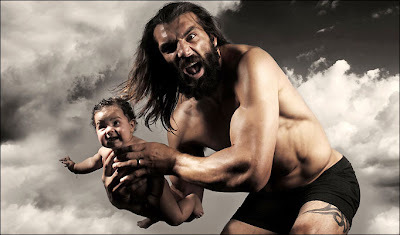 We later found out that this magnificent specimen is, in fact, Sebastien Chabal--a major French rugby player. But to me he will always be, quite simply, a caveman. I'm not sure what Caron is thinking. 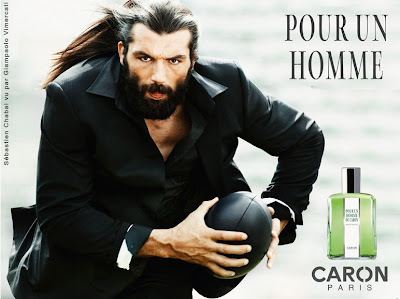 If there's anyone you probably don't want to smell like, it's Sebastien Chabal. Whatever cologne he's wearing, I'll take the antidote please. Unless of course I want to smell like a saber tooth tiger after a daylong hunt. 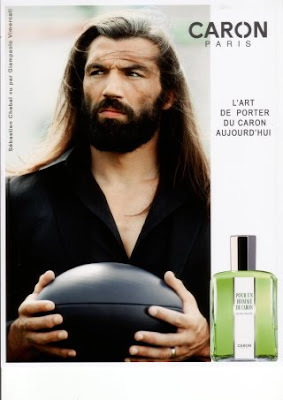 So, I am much indebted to Ben for calling my attention to this campaign and bringing the light of Chabal into my life. How could I have been so blind? I suppose 9 months of attempting to become a blasé Parisian has made me just that... blasé. But if assimilating to Paris means I don't instantly laugh at something like this, I'm not sure I want to be Parisian after all. Well done. Go Ben! Go Tory! The baby looks delighted that it is about to be eaten.